Ideal for school trips or for children who walk to school in the dark mornings and walking home in the dark evenings. 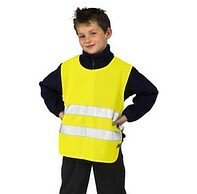 TGS also stock Hi Visibility garments for the adults who accompany the children on such walks. Our garments are made with Hi Viz Tex silver retro reflective tape which is fully certified to meet EN1150 standard. Hi Viz Tex gives you a superior performance for use in all weather conditions.